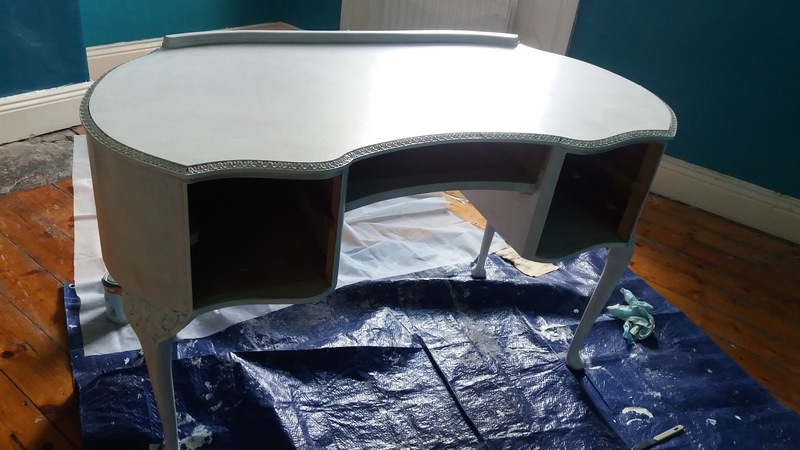 Tales From A Geordie Goth : Dressing Table Makeover Part One, Desk Paint. At the moment, I'm in love with the french boudoir style bedroom but typically these use more whites and creams, which colour I loathe. I wanted lilac walls with black furniture. 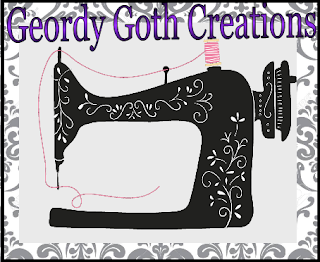 I've found tonnes of inspiration via Pinterest which is amazing as a digital mood board, I'm not the most organised person and I hate paper based things lying around. So, Pinterest has really help organised my ideas. 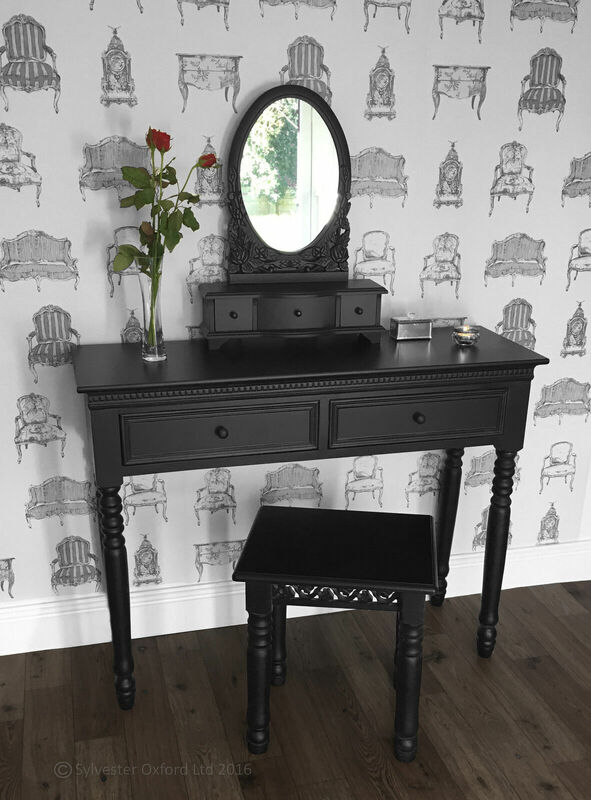 My little black heart has been yearning for is a dressing tables,I love the french rococo style dressing tables. 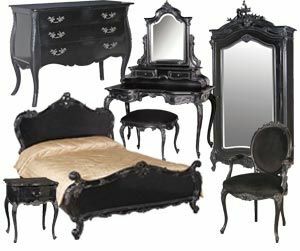 I've found some stunning ones on eBay, and most averaged around £90, but they were made from MDF, personally I thought they're expensive for the quality. I decided to see if I could find a second hand one dressing table, I didn't have much work as most of the dressing tables were more expensive than theBayay ones. 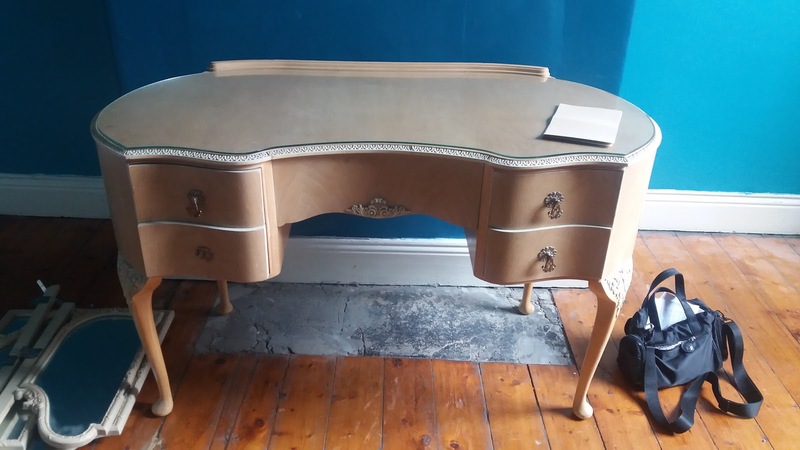 About a few months ago, I found a Louis 14th Olympus dressing table from the charity shop, and I love fell in love with it straight away. I found working past the boyfriend ogling it like a dog looking at a roast chicken. Next morning I rang the shop up and begging them to keep it headed straight down to pay for it. When I first bought it. I didn't think it came with a mirror, when it arrived, it came with the mirror. 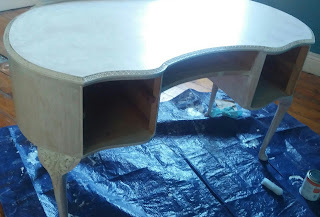 The dressing table is made from solid wood, very happy. 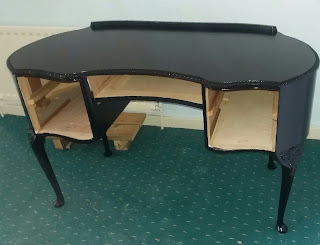 Everybody who's seen it has complimented me on it and even my mam scolded me for wanting to paint it black. But you guessed it I'm painting it black. I placed the table on tarp and covers, I lightly sanded all the table. I washed all the table with a cloth and washing up liquid removing all the grime, dust and dirt. 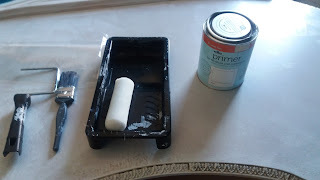 I applied all the paint using a small gloss paint tray set for £1 for Wilko's opted for the sponge roller as gave the best finish. I attempted to a paint brush and the manmade mohair roller neither of these provided a smooth finish. I primed the table using Wilkinson's Wilko's Multisurface Furniture and Cupboard Primer. It cost £9.95. for 750ml of primer, I felt dubious about purchasing the paint before even considering it I read the customer's reviews all sounded very positive. After using their using their previous ranges; I decided to give it a go. At first, I thought the paint seemed thin, and runny creating an unconvincing translucent coverage. Yet, the company suggest two coats of Primer. I left overnight to dry because I wanted to take my time and produce the best results. However, the instructions suggest that it could be dry in thirty minutes but the instructions recommend for to dry for a least an hour or more for best results. 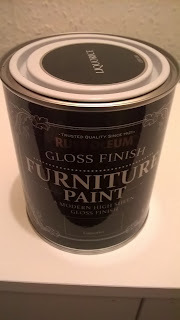 I used the leftover paint from My first DIY cupboard, Rust-Oleum Gloss Furniture Paint Liquorice black. Previously I used a paint brush but after doing the cupboard and regretted. I thought I would try the form roller. On the first applications, the paint looked bubbly and spongy from the form roller. I thought I give it another try and waited at until it fully dried.It looked beautifully smooth and shiny. I found with paint I had to do at least four thin coats of paints to get the finish I wanted. I think for the top I did five to six as the top look uneven. Give us till after Christmas. I'm hoping well be in before Halloween. Gorgeous, you are really good at this 'stuff' - I'm completely cack handed! Thanks I'm not too bad, I would benefit from more practice. There still a few issues I haven't worked out yet. 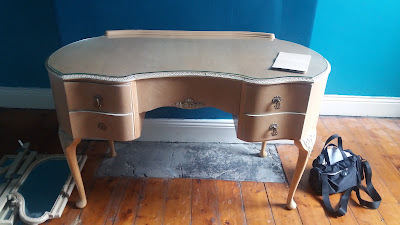 I had a dressing table too, but I sold it last week. The one I had was simply old (in a bad way, not antique or cool, just... old) and the design was not what I wanted. And it was white. 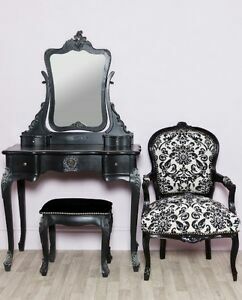 I don't think I have room for dressing table in my new apartment, but if I do, I want a black one too! :D Or mahogany. Thank you that's lovely of you to say. I was looky to find this one. I've always wanted one never had the space for one. Good luck on your. Move. That table seems to have turned out really well - it looks awesome. I'm definitely a fan of "paint it black". Thanks I found working the black gloss paint was bit of nightmare to get a nice smooth finish. I love painting black. Thanks but it was partially the paint. 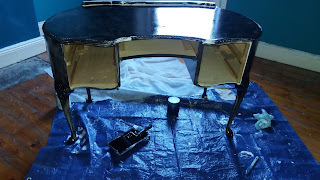 Rustoleum goes so easy and dries very smothly. I love the furniture! I hope you don't mind I stole some of your inspiration photos for my own reference! No I don't mind, I feel kind of honored, so thanks.